At Doug Cleghorn Bathrooms, we regularly carry out luxury installations for bathrooms in Wetherby. One of our favourite market towns within the City of Leeds metropolitan borough, Wetherby is home to Ribston Hall, Sandringham Park and the Georgian Bath House which dates back to 1824. Wetherby’s stylish and upmarket town centre is also full of delightfully small shops which are a refreshing change to the multinationals that often seem to take over. Even more impressively, the town was also recently listed in the 2018 Sunday Times report as one of the Best Places to Live in Northern England. If you’re in the market for an outstanding transformation, read on to find out more about our design and installation service for luxury bathrooms in Wetherby. Over the last few years, we have been responsible for carrying out many stunning bathroom renovations in the Wetherby area. Modern and contemporary bathrooms appear to be a popular choice. We are, however, able to design a more traditional bathroom that also includes period-style furniture. 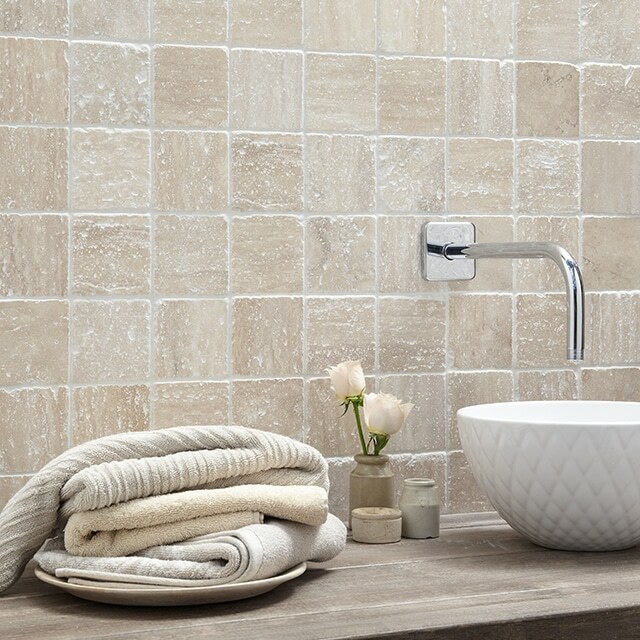 Tiles are also generally kept to a classic look, with both travertine and stipple beige being strong favourites. This Wetherby bathroom, in particular, featured beautiful neutral wall and floor tiles. Additionally, when this finish is paired with either ceramic or wooden accessories, the end result is luxurious and effortlessly tranquil. Our useful in-house tiling service also means that everyone is singing from the same hymn sheet with the same end goal of absolute perfection. When you choose to work with Doug Cleghorn Bathrooms, you also choose priceless expertise and absolute convenience. After purchasing your new bathroom suite from our designer showroom, your exclusive project manager will then work with you on your refurbishment from start to finish, at a price that is affordable and with only the highest quality of workmanship. As we also do a lot of our planning prior to the work commencing, you’ll find that the renovation process is as straightforward as possible, leaving no room for headaches, just your beautiful new bathroom suite. At Doug Cleghorn Bathrooms, there’s nothing we love more than designing for bathrooms in Wetherby. Whatever your taste may be, we can bring your dream bathroom to life and nothing is left to the imagination whether traditional, contemporary, offbeat or glamorous. With our Leeds bathroom showroom also only a 15-minute drive away via the A58, we invite you to call in soon to discuss your unique bathroom objectives. Luxury Bathrooms in Wetherby. Image source: Verona Group.